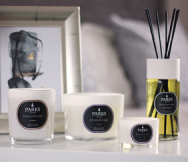 The Parks No 2 candle—bergamot and mandarin—is a lovely blend of fruity, citrus scents that can lighten almost any atmosphere. This scent in particular is strongly reminiscent of Earl Grey and Lady Grey teas, making it the perfect accompaniment to a relaxing afternoon cuppa. The scent of bergamot has been compared to orange and lemon, which the fruit closely resembles, but has distinct floral notes that completely change the aromatic profile of these candles, combining perfectly with the classic scent of mandarin oranges. Hints of jasmine and rose wonderfully complete the experience. Aroma therapists suggest that bergamot is particularly helpful in resisting against blue moods or depression. Combined with mandarin orange’s purported warming, emotionally-uplifting effects, the scent of bergamot helps to improve many people’s moods, even by making the environment more pleasant. The candle itself is a model of pure, natural craft. Only the best all-natural waxes are combined to produce a clean-burning, long-lasting base (with a total burn time of more than 48 continuous hours). An advanced, all-natural, soot-free wick enhances this effect. Lastly, we use only the purest premium essential oils, which provide a stable, long-lasting scent that begins to fill any space as soon as you light it. This lovely little candle makes the perfect gift, as it comes in a luxury presentation box that will keep it safe and fresh, and ensure it stands out proudly in any care package or gift bouquet. Of course, it is also perfect all by itself as well!